My mother-in-law introduced me to cinnamon ice-cream last week and now I am totally hooked. It may become my new go-to flavor for topping peach cobblers in summer and apple tartlets in the fall. The subtle fragrance of cinnamon is a tasty alternative to the standard vanilla ice-cream topping without overwhelming other flavors. Of course, this cinnamon ice-cream is also delicious on its own. We finished off the first quart in about 2 days. 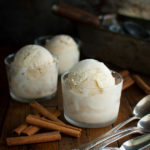 The first recipe for cinnamon ice-cream I tried used twice as many egg yolks and half as much cinnamon. It was really good but I felt a dozen egg yolks in a quart of ice-cream was excessive and I didn’t like how all the yolks made the ice-cream too yellow. I researched other recipes and found this one from David Lebovitz (ice-cream expert extraordinaire). I prefer this recipe with its stronger emphasize on the cinnamon flavor. As David Lebovitz advises, smell your cinnamon to check for freshness before using it. It should smell pleasantly spicy. If you can’t smell anything or the cinnamon smells musty, it’s time to replace it. This recipe infuses the custard base with 10 cinnamon sticks which will seem like too much but it’s all necessary. I made a batch with only 5 cinnamon sticks and the flavor didn’t come through as well. You can further enhance the cinnamon flavor by adding some ground cinnamon to the custard just before churning it. I ended up adding about 1/8 teaspoon each time I made this recipe. Heat the milk, sugar, salt, cinnamon sticks, and 1 cup heavy cream together in a medium saucepan until sugar is dissolved and mixture just begins to simmer. Stir the mixture as it is heating up to keep the milk from burning. Remove milk mixture from heat, cover, and let steep 1 hour. Rewarm the milk mixture until just steaming, then remove the larger pieces of cinnamon sticks with a slotted spoon. Don’t worry about the smaller pieces since they’ll get strained out later. In a small bowl, whisk together the egg yolks. Gradually add some of the warm milk mixture to the yolks, whisking constantly. Continue slowly adding the hot milk to the eggs until you have added about half the milk mixture. Pour the warmed yolks back into the saucepan and cook over medium heat, stirring constantly and scraping the bottom with a heatproof spatula, until the custard thickens and coats the spatula. Remove from heat and immediately strain the custard through a fine-mesh strainer into a clean bowl. Place the bowl in a larger bowl partially filled with ice water, being careful not to get any water in the custard. Whisk in remaining 1 cup of cream. Stir custard occasionally until mixture is cool. Cover the custard with plastic wrap and refrigerate until very cold, preferably overnight. When ready to churn the ice-cream, taste the custard and add a bit of ground cinnamon, if desired. Transfer the mixture to an ice cream maker and freeze according to the manufacturer’s instructions. Then, transfer the ice-cream to a freezer-safe container, cover and freeze until firm, 3 to 4 hours, before serving. Yum, we’re making this right now 🙂 My son has been wanting to make it since I came back from Houston and showed him your website. Any suggestions for good ice cream containers (for ice cream storage)? Hi Mieke. It was great seeing you. I’m so happy you’re trying a recipe from the website. I am a big fan of the ice-cream containers from Tovolo. They are double walled so the ice-cream is well insulated and the long, narrow shape makes scooping so much easier. I have two containers and love them. They are available at Williams-Sonoma and Sur La Table and probably Amazon.